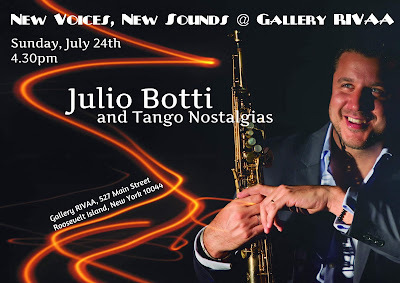 Roosevelt Island's Gallery RIVAA invites you to a special Sunday afternoon concert of Tango Jazz with Julio Botti and Tango Nostagias. 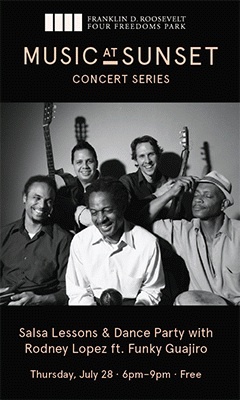 TANGO JAZZ at its finest ! Please join us on Sunday, July 24th at Gallery RIVAA at 4:30pm as Julio Botti’s Tango Nostalgias introduces a fresh new voice to the nuevo tango movement pioneered decades ago by Astor Piazzolla and Pablo Ziegler, Piazzolla’s longtime pianist and a prolific composer and producer in his own right. For this coming out party for the young Argentinian saxophonist, an instrument not normally associated with tango music, Ziegler has re-arranged some of his most potent compositions specifically with Botti’s soaring soprano horn in mind. Here's a taste of Julio Botti & Tango Nostagias. to and from Manhattan this weekend. That's 7 weekends in a row. 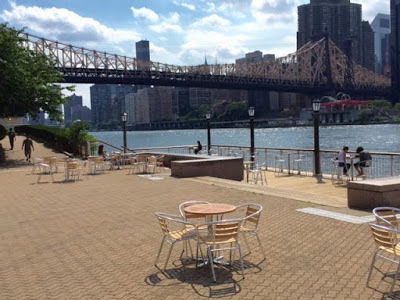 As a reminder, the Roosevelt Island Cooling Center, located at 546 Main St., will be open Friday, July 22, Saturday, July 23 and Sunday, July 24, from 9 AM- 5 PM when the National Weather Service issues a Heat Advisory for the New York City area. This advisory is issued for New York City area when the combination of heat and humidity is expected to make it feel like it is at least 95 degrees for two consecutive days, or 100 degrees for any length of time. 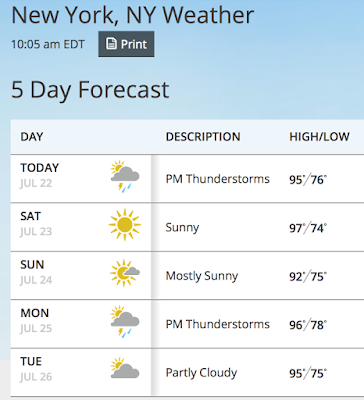 Individuals without air conditioning, particularly those at risk for heat-related illness, should use established cooling centers during a heat wave. 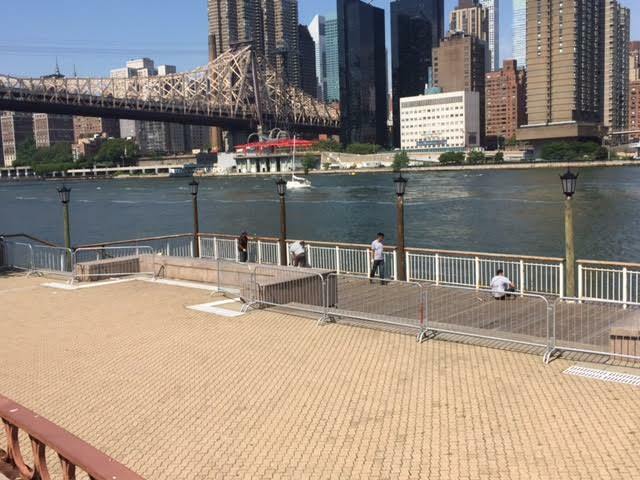 Will There Be A Roosevelt Island Public Outdoor Viewing Of 2016 Rio Olympics Opening Ceremony This Year? The 2016 Olympics in Rio de Janeiro Brazil takes place August 5 - 21.
using a large inflatable screen at the Riverwalk Commons lawn. It was a wonderful evening with Roosevelt Island residents from all over the world gathered together to cheer their home country teams entering the Olympic arena. During the 2012 Olympics, RIOC put up a big outdoor screen in Southtown for a public viewing of the opening ceremonies. It was very popular among the residents and brought out alot of people. Does RIOC have plans to do the same for 2016 Olympics? The date is Friday August 5. So far, I have not received an answer from RIOC if they intend to have a public viewing of the 2016 Olympics opening ceremony this year. RIOC previously scheduled an outdoor movie showing of Across The Universe at Firefighters Field for August 5. Will update if I receive more info. have more on the 2016 Rio Olympics. 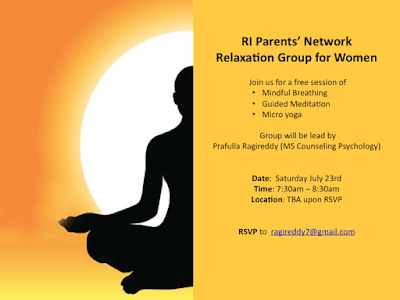 The Roosevelt Island Parents' Network (RIPN) is hosting a Saturday Morning Relaxation Group for Women. 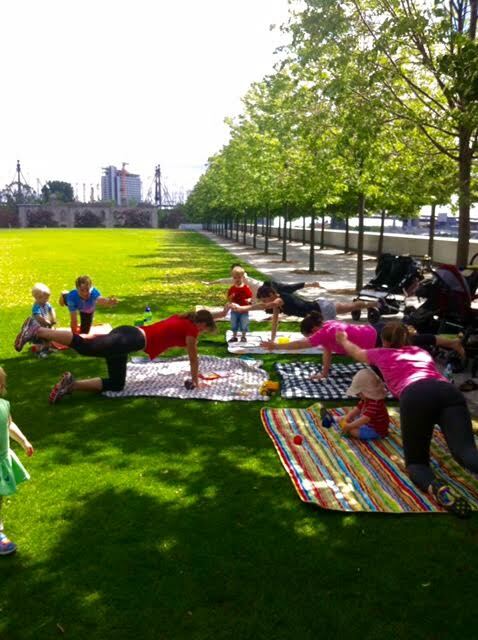 We meet once a week on Saturday mornings from 7:30 to 8:30 for this summer. Group's focus is on mindfulness (mindful breathing, meditation and gentle yoga). Please RSVP if you wish to join us. 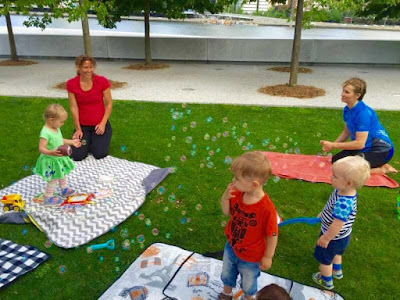 chat and play on Friday July 22, 2016 (instead of Monday), at 9:30am at the Tram kiosk. to open for the start of the Fall 2017 semester. The Assistant Director of Safety & Security has responsibility for the direction and leadership of the safety and security of Cornell Tech and, as such, plays a major role in the safety and security of the entire campus community. Reporting to the Senior Director of Facilities Operations, the Assistant Director is expected to lead, promote, and support the Department of Safety & Security (DSS) as a comprehensive, customer-sensitive campus security enforcement unit within the physical boundaries of the Cornell Tech campus, and to coordinate DSS activities with those of local law enforcement, fire, and safety services. This role plans, organizes, directs and administers the overall emergency response, security planning, and compliance initiatives for DSS. This includes development and administration of safety education, safety policies, emergency management and enforcement of Campus policies. The Assistant Director is responsible for all operational and administrative matters of the DSS, and will represent the campus’s interest in security matters with senior administrators, local officials, faculty members, community members, students, staff, and others. 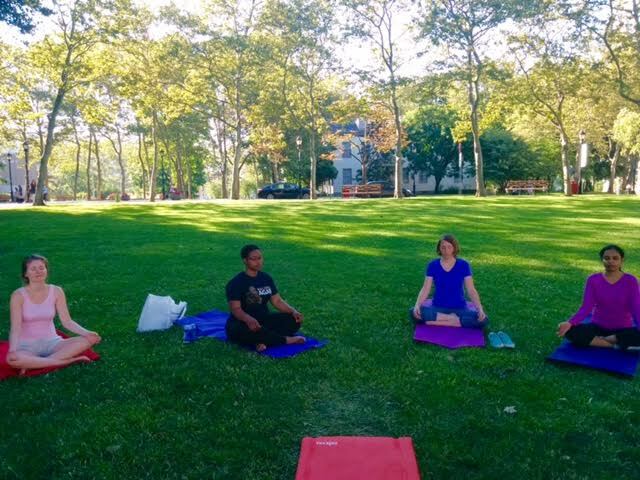 during June 13 Roosevelt Island Town Hall Meeting. 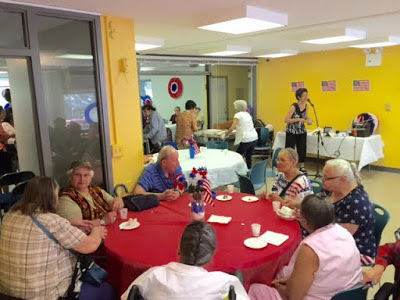 As of July 1, 2016 the Carter Burden Center for the Aging became the new sponsor of the Roosevelt Island Senior Center, which is designated as a satellite of the Carter Burden Luncheon Club and Senior Program. The center provides a variety of socialization, recreation and education programs free of charge including: weekday congregate luncheon meals; exercise, dance and yoga classes; computer training ; health and wellness activities; arts programs; holiday parties; and other activities. Case assistance is offered to members/participants who need help in applying for government benefit programs, addressing landlord/tenant disputes, or accessing medical care. The center also delivers weekday meals to homebound individuals on Roosevelt Island. Below is the Roosevelt Island Senior Center schedule for the rest of July 2016. Click on the link for full view of the schedule. Don't forget the July 29 General Meeting of the Carter Burden Roosevelt Island Senior Center and to fill out survey about program and services desired at the Senior Center. More info here. 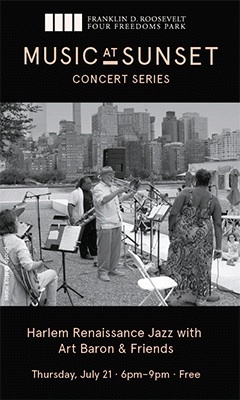 You're invited to the Roosevelt Island FDR Four Freedoms Park free Music at Sunset Concert Series starting Thursday July 21. 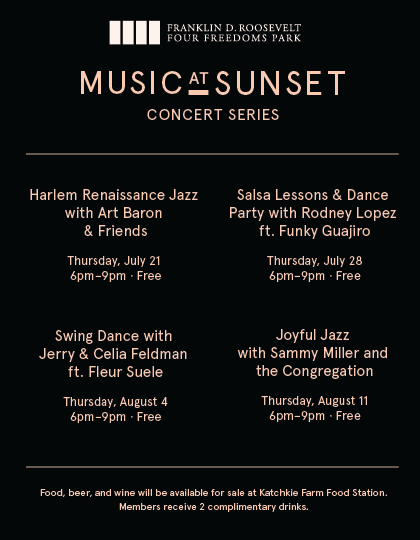 On select Thursdays in July and August, Four Freedoms Park will host a Music at Sunset concert series with performances ranging from jazz to salsa to swing dance. 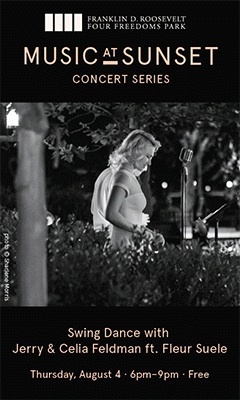 The series also includes two opportunities to learn how to dance. On July 28, visitors are invited to learn salsa from acclaimed instructor Rodney Lopez, and on August 4, they can learn to swing dance from Jerry & Celia Feldman. 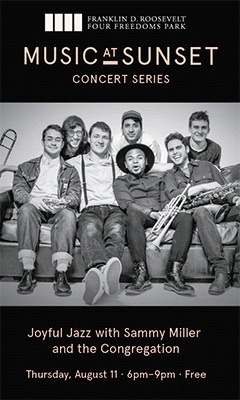 Renowned jazz musician, Art Baron, kicks off the season with sounds of the Harlem Renaissance and the Jazz age on Thursday, July 21, and Sammy Miller and the Congregation closes it with their unique style of jazz – joyful jazz. The Katchkie Farm Food Station will be selling beer, wine, and various meals and snacks from 5pm-9pm. Performances are FREE. Click here to learn more. 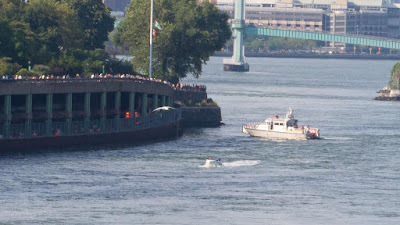 NYPD Harbor Patrol and Helicopter Unit spotted on East River near Carl Schurz Park from Roosevelt Island yesterday afternoon. Some type of police action near Carl Schurz Park. Have any idea what it was? 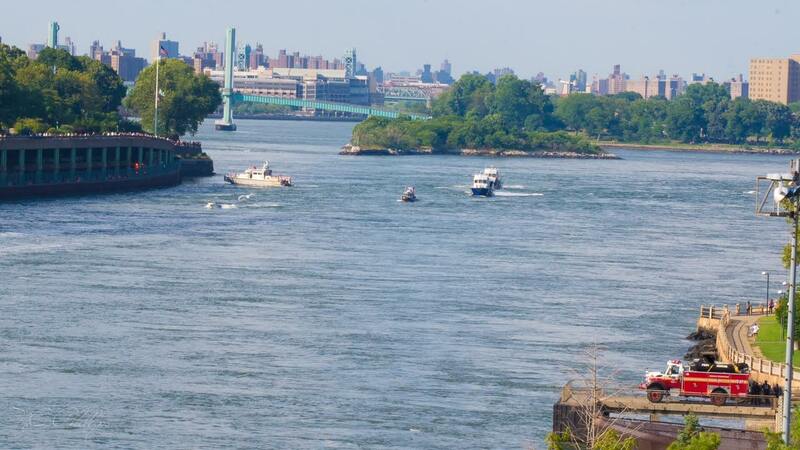 Manhattan: East 85 St & FDR, ESU & NYPD Harbor on scene with a person into the water at the east river, Aided removed with CPR in progress. As previously reported, the Carter Burden Center for the Aging took over sponsorship of the Roosevelt Island Senior Center on July 1. 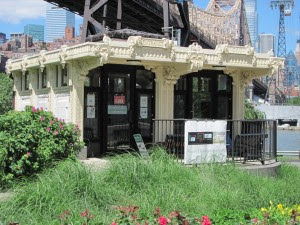 ... the first General Member Meeting of the Roosevelt Island Senior Center: A Program of the Carter Burden Center for the Aging will be held on Friday, July 29th at 12:30pm at the Senior Center, 546 Main Street. William Dionne, Executive Director, will attend and provide updates on learning from our first month as the new sponsor of the Senior Center and initial results from the member survey. Roosevelt Island Senior Center members are invited to attend the meeting. 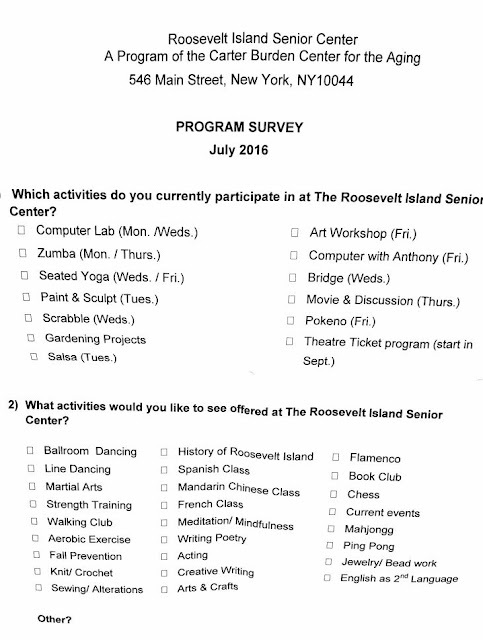 The Roosevelt Island Senior Center asks Seniors to tell them what type of programs and services they want. Print out and answer the survey below to tell them. 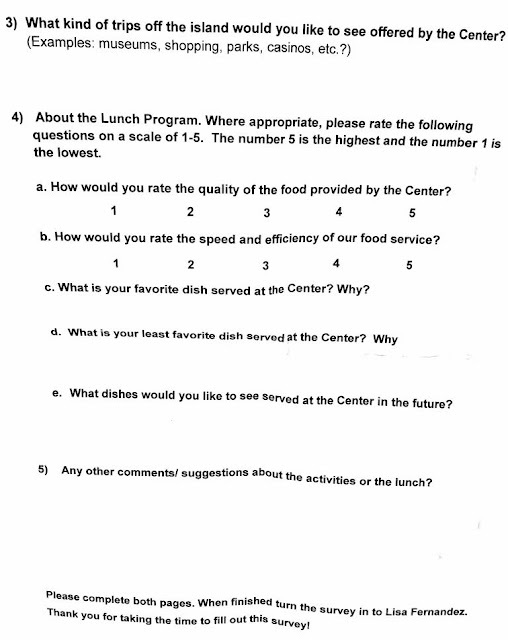 Then bring the completed survey to the Senior Center or pick up a survey at the Senior Center to answer the questions.. Burden did was reduce the salaries of our well deserved instructors who earned every cent. We lost 2 of our instructors due to this. Why change what works, just enhance. As much as I appreciate Assembly Member Seawright, trying to help, by coming through with additional funding, it will not be going to the teachers that we lost. It will go to what Carter Burden wants and not necessarily for the things that the people who use the center want. Carter burden is here to serve the seniors not the other way around. Those who do not use the teachers services cannot comprehend what a loss it is to not have doctorate level and PHD level exercise instructors to help seniors with their physical exercise needs. Other Roosevelt Island seniors support the Carter Burden Center. I am thrilled that Carter Burden has taken over management and operations of the Senior Center. For years the center management did not have a welcoming environment. Since the DFDA came in last May and Carter Burden last week, the staff is open and welcoming. WIth the support of the community our center can become a showplace and welcoming. The petty squabbles of the last few weeks hopefully have ended and a new leaf has been turned over. It is time for all island organizations to work with the Carter Burden staff to offer programming, volunteers and enrichment programs for all members. Change is always hard, but I think if the community works with CBC, we will all find great services with them. I have heard that they are looking to cook meals eventually instead of the unhealthy meals that have been served for years. I have looked at their website also and am very impressed... I think we as a community need to welcome them and work with them instead of presenting them with all of the negativity that has been created. CBC is in charge of the center and it seems like people don't to want to accept that! There are many organizations and committees on the island that are supporting them and wanting to work alongside them not to be in competition with them..
More on the Carter Burden Center sponsorship of Roosevelt Island Seniors Center at prior post. 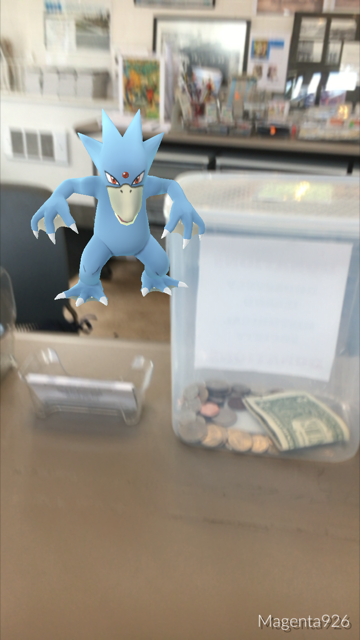 Pokemon Go Mobile Phone App Species Spotted At Roosevelt Island Historical Society Visitors Center Kiosk Today - Did You Catch Magenta? was spotted at the RIHS Visitors Center Kiosk today.